On July 30, 2018, Zimbabwe will have its first post-Mugabe harmonised election, where 23 candidates from 22 political parties will engage in mortal political combat for the country's presidency. Over 1648 candidates from at least 55 political parties (about 220 are independent candidates) will compete for 210 National Assembly seats, while 7564 candidates will run to fill 1964 places in 89 local authorities. [i] Besides not featuring Robert Mugabe and his late nemesis Morgan Tsvangirai in the presidential race, the election features the highest number of presidential hopefuls in Zimbabwe’s electoral history and offers an entirely new slate of contenders, as none of them has contested in a presidential election before. The two leading contenders are President Emmerson Mnangagwa of the ruling Zanu-PF and Advocate Nelson Chamisa of the Movement for Democratic Change (MDC)-Alliance. For the presidential race, Afrobarometer suggests a statistical dead heat, with 40 percent (down from 43 percent in May 2018) of polled voters saying they would vote for Mnangagwa, and 37 percent (up from 31 percent in May 2018) saying they would vote for Chamisa. 21 percent of those surveyed either refused to share their voting intentions or were undecided. [ii] This article provides an overview of how the two leading contenders for the Presidency have gone about winning the hearts and minds of Zimbabweans in the 2018 electoral race. Mnangagwa and Chamisa come from different political stocks, traditions, and generations. Mnangagwa, nicknamed Ngwena (the Crocodile), is a 77-year-old veteran of the liberation war, whose political tradition is steeped in the security sector. Mnangagwa is a shrewd operator, who despite limited charisma has bent the Zanu-PF and Zimbabwean political steel to his will. His survival in Zanu-PF has often been through outmaneuvering opponents strategically, and, as November 2017 showed, forcefully, rather than democratically or through popular politics. [iii] Chamisa, nicknamed Nero (or Cobra), is a charismatic 40-year-old former student and youth leader, who is a trained marketer, evangelist, political scientist, and lawyer. He is given to popular and populist politics, and has consistently run and won elections at multiple levels since the late 90's, bar a loss in the race to be Secretary General of the MDC in 2014. Mnangagwa and Chamisa both see opportunities to increase their political stock in this election. For Mnangagwa's Zanu-PF, the election is an opportunity to legitimise the November 2017 coup. [iv] In this effort, Zanu-PF has been faced with the onerous propaganda task of paradoxically arguing for the preservation of the old (legacy), while also arguing that it has and is facilitating change (new dispensation), although presided over by the old who fought in the liberation struggle. Zanu-PF’s Manifesto is summed up in its tagline, “Unite, Fight corruption, Develop, Re-Engage, Create Jobs”. The Zanu-PF strategy seems to have been to eat their cake and have it, through trying to limit Mnangagwa’s record to the eight months he has been president, rather than the 38 years he has been in government. This approach has proved onerous, as part of Mnangagwa's appeal is experience, yet the bulk of that experience has been as Mugabe's right-hand man. For Nelson Chamisa’s MDC-Alliance, the elections present the best opportunity in their 20-year history to facilitate regime change. This is on account of their unprecedented ability to campaign in previously “no go” rural areas; the presence of international observers previously banned by Mugabe, and a deformed Zanu-PF, weaker than it was in 2013 on account of factional fights. Also, there is a perception that Zanu-PF’s control over the security sector beyond the army is limited, leading to perceptions of Zanu-PF’s inability to master the cohesion to facilitate the kind of grand electoral theft that it has been accused of perpetrating in the past. The young voting population has buoyed Chamisa's candidature, and his relative youth has spurred him on. Chamisa’s central value proposition is to unsettle the old gerontocratic political order, which he alleges Zanu-PF represents, through ushering in a generational transition. His campaign’s tagline from the MDC-Alliance’s Sustainable and Modernization Agenda for Real Transformation (SMART) Pledge, is “Behold the new: Change that delivers." However, like Zanu-PF, contradictions also abound, amidst allegations that although young, Chamisa's rhetoric and positioning on some social issues are as conservative as those of the old order, if not worse, especially as it relates to women, gender, and gender roles. Chamisa is aided by his magnetism, charisma, and exceptional oratory skills. His appeals to the electorate have been both charismatic and programmatic on account of the pillars of his SMART campaign platform. At the beginning of his campaign, Chamisa inherited a broke party, which was deeply divided, had lost the support of international partners and the former white farmers, and was barely in touch with its civil society and labour roots. But Chamisa has mitigated these institutional deficiencies through leveraging the MDC’s mobilising power, and the strategic experience of some of Tsvangirai’s old lieutenants. He has also been able to build a competent voluntary campaign team supported by a sleuth of strategic technical operators from across generations of former student leaders. 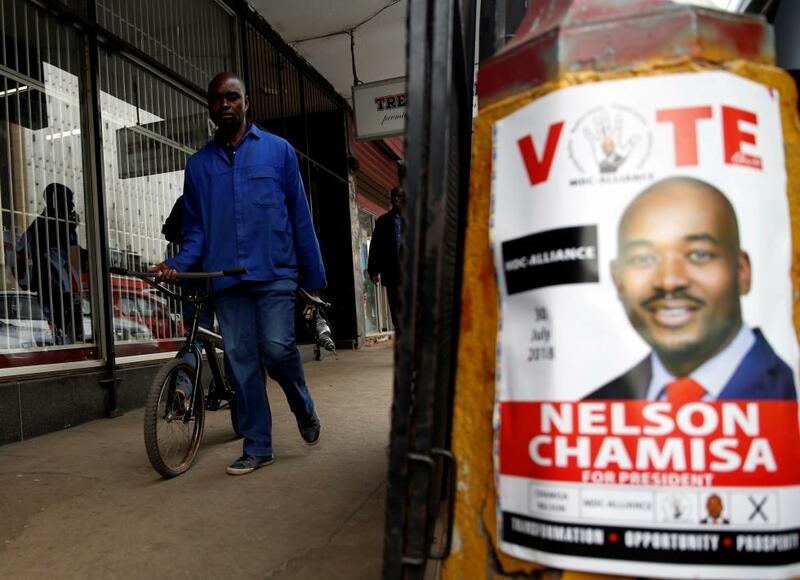 In the wake of limited resources, Chamisa has appealed for individual donations from supporters through mobile money, and his party’s campaign has primarily hinged on low cost canvassing through door-to-door campaigns, and very few media ad buys. This talented improvisation has done well for Chamisa in the campaign, but questions remain on whether the powerful MDC-Alliance mobilisation machine can turn out the vote for Chamisa on Election Day. Mnangagwa presides over a formidable institution in Zanu-PF, whose conflation with the state has readily presented him with a solid political machine that has in the past churned out victories for his predecessor, often at his command. Post the 2017 coup, Mnangagwa brought back, into the Zanu-PF commissariat, the team of soldiers and spies that presided over the Zanu-PF 2013 campaign. On assuming the Zanu-PF mantle, perceptions were rife that Mnangagwa was a weak candidate. Because of perceptions of Mnangagwa’s "dullness" the Zanu-PF political machine has been in propaganda overdrive building up their candidate and making him shine through contrived campaign images of an affable, smiling Mnangagwa and short clips of choreographed small vocal doses. Resultantly, Mnangagwa has turned out to be a candidate who shines more on account of, not what he says or does, but what others say about him, and do on his behalf. His lack of charisma has led at some points during the campaign trail to large crowds and supporters, which the machine turned out to his rallies, leaving before and during his long addresses. [v] Lacking charisma, Mnangagwa's appeals have thus been mainly programmatic, centred on trying to appeal through performance legitimacy. Mnangagwa has mitigated his own shortcomings through ensuring that Zanu-PF rallies are entertainment filled with some of the best artists in the country performing, while also leaning heavily on his deputy General Constantine Chiwenga, who despite his poor English pronunciation, has proved to be quite an eloquent and engaging campaigner when he resorts to addressing multitudes in his native Shona. Zanu-PF campaigners have also attempted to present being “boring” as being serious and presidential, comparing it to Chamisa’s “entertaining” but hyperbolic and “unrealistic” pronouncements. Social media is one of the main deviations in the 2018 elections, from traditional campaigning in Zimbabwe. For good and bad reasons, Chamisa was trending on social media, and set the agenda and discourse in ways that the opposition has in the past failed to do. But as the Afrobarometer report from July 2017 shows, the hype must not be believed, at least not as a generalisation. The survey shows that for rural Zimbabwe, government radio remains the media of the people with word of mouth and meetings as the other primary sources of intel on the elections. For urban Zimbabwe it is government television and radio, word of mouth, social media, and newspapers. These sources are instructive in as far as they tell us whether the two primary gladiators have been attempting to win hearts and minds through the appropriate means. It is good then, that both Chamisa and Mnangagwa, while taking to Twitter and Facebook, have also traversed the length and breadth of Zimbabwe doing rallies and meetings. Chamisa has been running a "touch me, see me, feel me" campaign where the objective is to meet as many people as is possible. His target has primarily been rural Zimbabwe, formerly thought to be Zanu-PF strongholds. Given his limited access to government television and radio, this strategy has been inspired. It will no doubt help to increase Chamisa’s tally in these areas, but the usual approach is to forget about one's opponents strongholds and focus on areas that one's party can win, that is battleground constituencies and one's marginal strongholds. As such while the target to increase presidential votes may be met, it is possible that the strategy may cost the MDC-Alliance parliamentary seats in the neglected battleground and marginal opposition constituencies, especially in the cities. So while Chamisa has been fighting hard in Zanu country, his perceived base in urban areas and the youth have hardly been directly appealed to by his campaign, leaving them open to Mnangagwa and his attacks on the MDC’s record in local government. Mnangagwa’s charge into previously perceived opposition spaces will not get him the majority of votes but because in reality post the 2013 elections the cities ceased to be MDC strongholds becoming battlegrounds, they are ripe for Zanu-PF capture at least at parliamentary level. Mnangagwa has spared no expense in the 2018 election campaign, with a typical spend rate of about USD 200 million per month since April 2018. [viii] Zanu-PF has splashed billboards across the country, monopolised the airwaves on both public and pseudo-private[ix] platforms [x] as well as print and new media through sponsored outreaches. Resultantly, Mnangagwa has been able to send his carefully curated image to millions of households every day through radio and TV, and has invaded millions of Facebook and Twitter timelines through an army of new media hacks, called Varakashi, reported to be well-financed and powered by hundreds of government-owned TelOne cell phone lines and data bundles. Mnangagwa has taken comfort in incumbency and made fewer rally type campaign stops than Chamisa. This is due in part to the reality, that since inauguration as president, Mnangagwa has been running a “permanent campaign”. He has successfully conflated the business of government with his election efforts. As such, every bank, mine, business openings, groundbreaking ceremonies, deals signed, and visits made as state president, have all fed into a governing performance narrative used to evidence his capacity to voters. In short, while Chamisa has been campaigning for the presidency, Mnangagwa has focused more on doing the job of president, banking more on performance legitimacy than on performance politics ala Chamisa. This has left Chamisa and the MDC-Alliance to run against Mnangagwa’s 8-month in office, having failed to launch a meaningful attack on his 38-year long record in government. In effect, what Mnangagwa has successfully done is to remain fairly detached from the rat race to replace him, forcing Chamisa and the opposition to run against themselves through fighting each other and for Chamisa, his own guffs and gaffes, hyperbole and salty jokes. As 30 July approaches, Chamisa has the momentum, but Mnangagwa continues to have the upper hand on account of incumbency, a reliable political machine, as well as a wide berth of opposition political forces keener on fighting each other than they are to fight him. Before his assent, Mnangagwa's history and association with the Gukurahundi atrocities, limited charisma, and 37 years as Mugabe's henchman, made him a very uninteresting political prospect that many thought was unelectable. However, with elections beckoning, he has been spared the scrutiny of his record and character that could have been his demise. His "Varakashi" on the other hand, have done enough to make some sections of the electorate doubt the uprightness of Chamisa’s character, his maturity, ability and readiness to lead. The presidential race remains a David versus Goliath Affair. If Chamisa is able to turn the multitudes from his rallies into votes on Election Day, he may yet cause an upset against this Goliath of an opponent who has been in politics for longer than Chamisa has been alive. [i] Zimbabwe's parliament is a bicameral. National Assembly has 270 seats, of which 210 are directly contested using the first past the post system in single-member districts, while 60 seats are reserved for women through proportional representation using a party list system of 6 per province. The second chamber, Senate, is an 80-member senate where 60 seats are filled through direct elections (6 per province) while the Chiefs Council fills 16, two representatives of the disabled plus the Senate President and a deputy. [ix]. Members of Zanu-PF or people associated with them primarily own most of the privately owned radio stations.